I have an admission to make. I am an out-and-out acrophobe. Whether this is down to nature or nurture, I am not sure, but I had a parent who got dizzy stepping off a low kerb and I have either come away with their genes, or learned from their behaviour, or possibly both. But, whatever its cause, we are currently staring down the barrel of its effects. 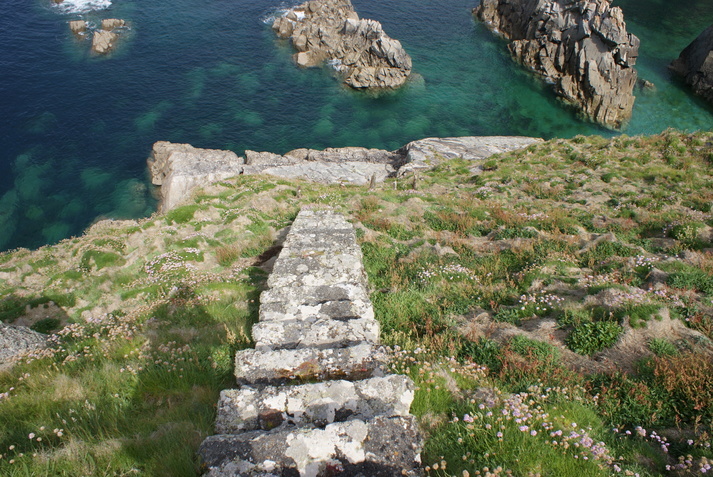 We are lucky enough to be on our way to Lundy Island for a whole week shortly. This is romance made real – it has a castle, rocky cliffs, smugglers, shipwrecks, islets, pirates, cannon, lighthouses, a unique letterbox trail that takes in some very challenging locations, ruins, Victorian eccentrics, giants, amazing wildlife, its own stamps and currency, and miles and miles of empty terrain, reminiscent of an island Dartmoor and perfect for walkers. But many of its most interesting features lie in places that a mountain goat might baulk at. Yes, the plateau is as flat as a pancake, but when you are standing up there, the prospect of losing one’s footing and rolling off down the sidelands or over the cliffs feels horribly real. 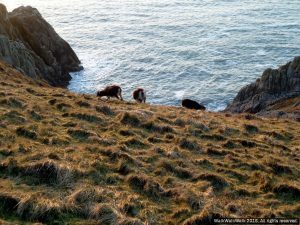 There are even legends (although possibly apocryphal) of cattle being blown clean off the island in gales. We made our first visit to this magical place last year and were immediately hooked. We scheduled a return visit (despite the two six-minute bursts of hell that constituted the winter helicopter flights). But the longer we stayed, the more dizzy we felt, until standing within 100 metres of the edge of the island felt like an unacceptable risk. Footpaths that had felt fine on our arrival now felt precipitous. Some of the letterboxes utterly unrecoverable. We staggered off the helicopter at Hartland Point having had a holiday of a lifetime, but physically and emotionally exhausted. So, how to manage all this better on our next visit, find a few more of those elusive letterboxes, and enjoy more of the adventurous stuff without taking dangerous risks? 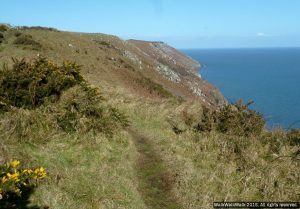 You could quite easily spend your whole time on Lundy strolling around the southern half of the island on relatively flat paths, enjoying the notable hospitality of the Marisco Tavern and finding those letterboxes pitched at a family audience. But that is not for us. The Lundy management actually has a great attitude to safety. It assumes that one is a grown-up, capable of competently assessing one’s own appetite for risk, and perfectly able to pitch one’s own activities accordingly. There are no fences, and few handrails. 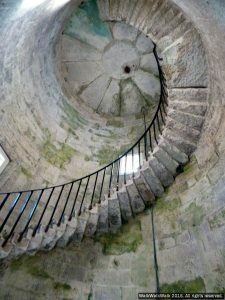 During a five-day visit we saw one safety warning – a hand-chalked affair which pointed out that the 147 steps to the top of the Old Light were a bit uneven and testing, and that one should maybe take this into account before embarking. (There is also allegedly a sign telling you not to use Montagu Steps as they now have more in common with a lift shaft, but since you’d have to step off the island plateau and into thin air to find out, I can only comment second-hand.) The idea seems to be that a forest of warning signs would simply lull visitors into a false sense of security, as well as ruining the look of the place, and this does seem to pay off. That is not to say that accidents don’t happen. During last year’s visit we heard a whirring overhead. “Odd,” we thought, “today’s not a helicopter day.” No, it wasn’t, and what we had heard was the Devon and Cornwall Air Ambulance taking someone off the island for medical treatment, a walker with an injured ankle who needed to go to hospital. That did give us pause. But at least you do know that there is a plan if something untoward should occur. 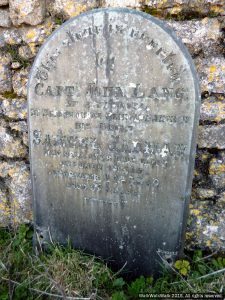 Accidents do happen… Samuel Jarman fell off the island to his death on December 24 1869. 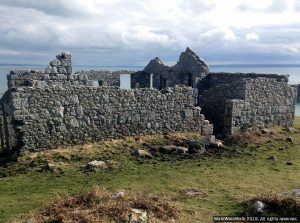 So how to visit Lundy and have a holiday that is physically and mentally refreshing, not draining, and allows for a level of challenge and adventure pitched to avoid both boredom and terror? One major difficulty of mastering a fear of heights is that it is a rational fear. If I do fall off a cliff, then I may indeed be severely injured or killed. A horror of, say, the English house spider can be mitigated (at least to a degree) by the understanding that, while it looks as unpleasant as hell, it can do you no harm whatsoever. The trick then with heights is to become more skilful in estimating risk – working out what is actually rational fear, and what irrational. 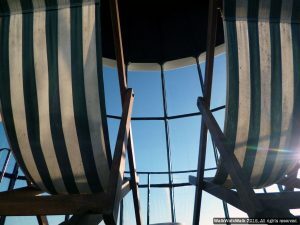 I am much better in high places that I can’t fall out of – thus we successfully made it to the top of the Old Light (just short of 100ft high) and sat in the deckchairs knowing that, however nauseous and insecure we felt, the actual risk of an unscheduled descent was quite slight. Nearly 100ft up, but falling out of these deckchairs should be quite difficult. I’ve been reading a lot of great stuff recently about the sport of scrambling. This is something beyond walking, but falls short of climbing, and perfectly describes the actions involved in getting to some of the more off-piste features of Lundy. The big takeaway was this: everyone is initially terrified. But some people overcome it better than others. There is no magic gene that allows people to hang by a bit of rope over a precipice and feel nothing. They have just learned how to focus their attention on the actions that keep them safe and moving, and not to dwell on a bigger picture that can only cause distraction and upset. This was a revelation to me. There is no shame in being scared, because everyone is scared. There is only shame in letting that stop you doing what you want to do. Secondly, gear can help. 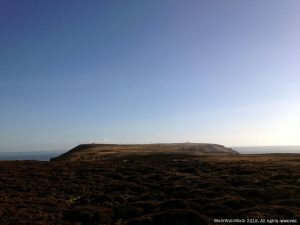 I tackled Lundy in heavy-duty old-school leather walking boots that pretty much immobilise the ankles and leave the feet with as much feeling for what is underfoot as a brick. This time I am going to take a lightweight boot – more robust than a climbing boot, but which will give me much more intelligence about the terrain and the flexibility to deal with it. Also, I am hostile to poles, but I have been persuaded that there is a use for poles here. With poles you can triangulate, make yourself feel more stable, keep the fear of heights a bit more at bay. And thirdly, practice makes perfect. Just like cold-water swimming, you need to acclimatise and practise. You can’t just turn up in challenging terrain on the first day of your holiday and expect to be able to walk out on a ridge with a perfectly clear head. You need to try the easier routes first, and get used to things without getting frightened. With a bit more of a feel for things, and some practice in focusing on moving safely rather than playing on repeat mental movies about you or loved ones falling to your deaths, it all starts to feel a lot more bearable. Yes, this requires mental and physical discipline, but you know that thing about nothing worthwhile being easy. 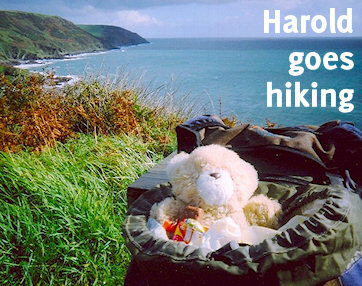 Categorised under Great walking locations, Tips and advice, tagged under acrophobia, fear of heights, islands, letterboxing, lighthouses, Lundy Island, scrambling. « Tips for choosing a challenge event.